I had been looking forward to reading Ace of Shades from the moment I heard about it. But it fell very much flat as soon as I read it. 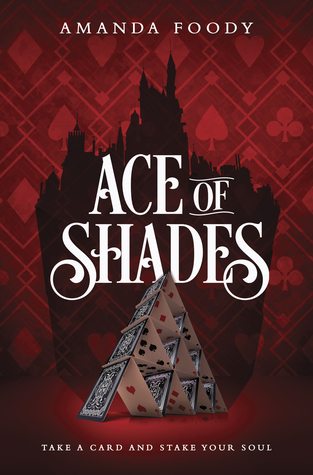 I give Ace of Shades by Amanda Foody two out of five hearts because it was a really big disappointment. At least for me. I didn’t care for Enne. Her name felt annoying to read and I couldn’t understand her. I missed a little more information on her and her mother. Without it, it felt very shallow and the world didn’t allure me as much as I had hoped. I cared so little for the characters in this book that I completely forgot to write a review on this book right after finishing it. Which is not something that happens often. I do wish I had liked Ace of Shades more than I did. But unfortunately, I didn’t. This entry was posted in Book Review and tagged Adventure, Amanda Foody, Book Review, Fantasy, Mystery, Romance. Bookmark the permalink.